Catalogue of Villanova College, 1918-19. Villanova Digital Library includes a selection of Villanova College’s academic catalogues published from 1871-1918. The earliest volumes published rarely changed in format and information provided which included a “Catalogue of Students,” listing students’ names their hometowns and states, and the annual Commencement ceremony and list of graduates. An interesting tidbit: the 70 students, listed in the 1870-71 catalogue, were mostly from Pennsylvania followed by Massachusetts and included Ireland, Cuba and Spain. 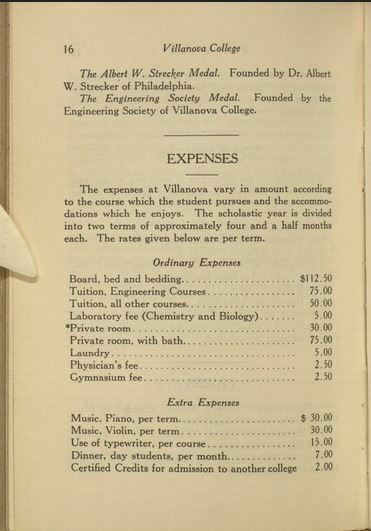 From the Seventy-fifth catalogue of Villanova College: Villanova, Delaware County, Pa.: conducted by the Augustinian fathers for the academic year 1918-1919, p. 16-17. Transcribed text from the digitized copy found in the University Catalogues of the Villanova Digital Collection. 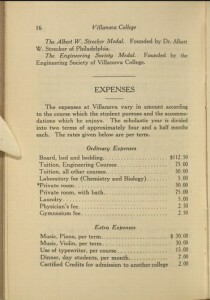 The expenses at Villanova vary in amount according to the course which the student pursues and the accommodations which he enjoys. The scholastic year is divided into two terms of approximately four and a half months each. The rates given below are per term. *A few rooms are sufficiently large for two students. The charge will be not be reduced on that account. In addition to the above, a deposit of fifteen dollars ($15.00) is required of every student at the beginning of each scholastic year to cover injury to property, breakage, etc. Any balance remaining at the end of the year will be refunded on application or credited to the student’s account for the next year. Every student is held personally responsible for property entrusted to his care or assigned for his use.